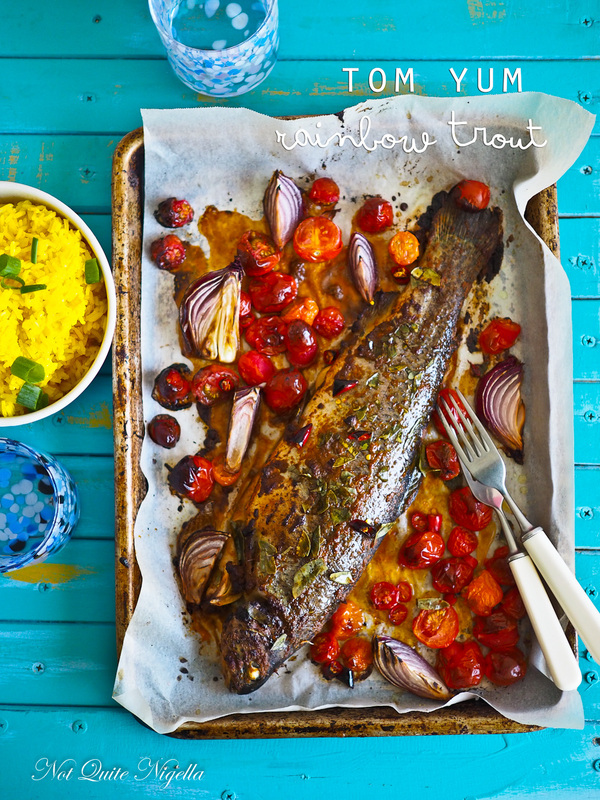 Fishing For Compliments: Tom Yum Baked Rainbow Trout! 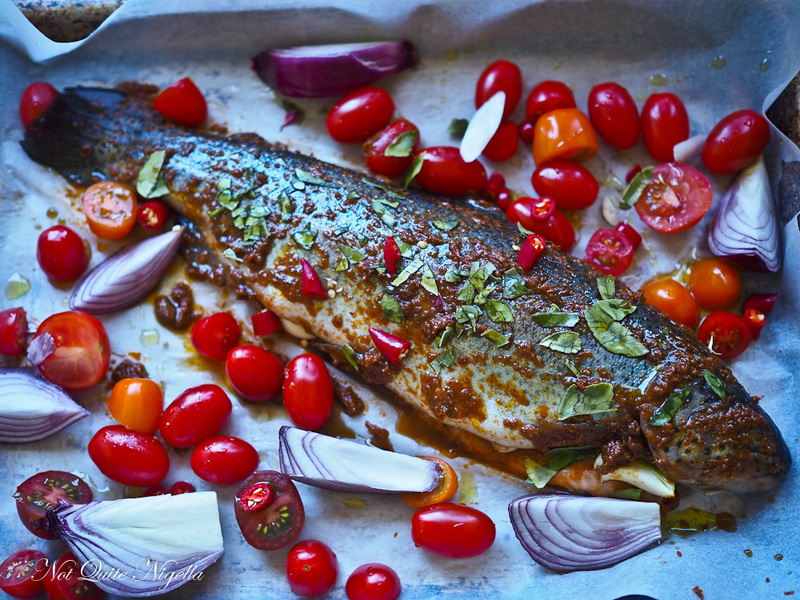 Dear Reader, are you ever stumped or out of ideas for how to prepare a whole baked fish? 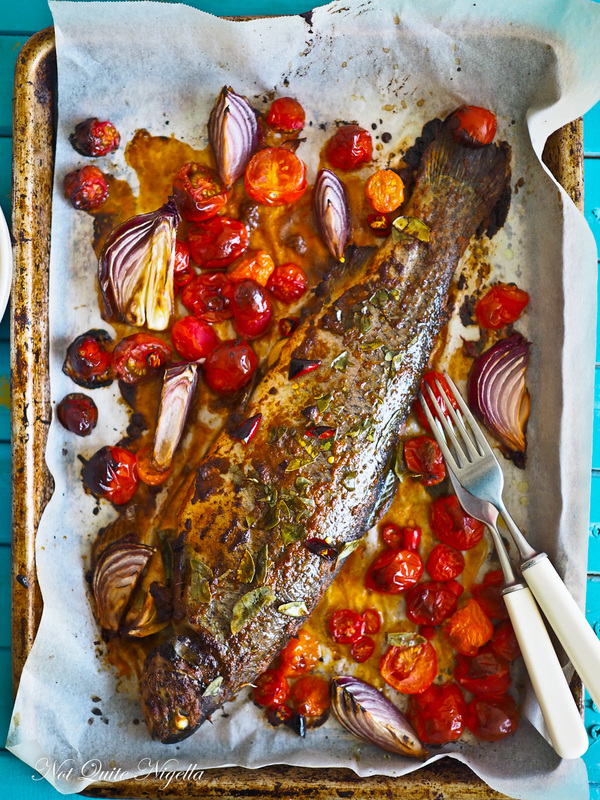 Try this flavoursome twist on a whole baked rainbow trout with the best of summer's tomatoes and garlic plus a tom yum spice paste. With 10 minutes prep, dinner will be a breeze! I am that person often that you'll find at the shop staring at the display of food intently. The person that the staff will ask a few times if they can help them. I'm busy looking at the food wondering how I should cook it. I often get stumped with whole fish. I feel like there are a few different ways to cook it but I've tried most of them and I always want to try a new way. And when I had an urge for Thai food, I thought I'd give a baked whole fish in tom yum paste a go. This method cooks the trout so perfectly so that it is luscious and succulent inside but seasoned so well with spices and seasonings on the outside. I'm also that person, you know the kind that always has these nonsensical exchanges with people. Like when I'm at the airport and I buy some water and they say, "Enjoy your flight," and I automatically answer, "You too" and then I never know whether to correct myself and make a bigger deal out of it or just walk away and hope that they didn't hear me properly. Like when I went to buy a fish for this recipe. "Enjoy your fish," they said. "Thanks, you too!" I answered before rolling my eyes at myself. But honestly I enjoyed this method of baking the fish so much I'll have to try it again. And did I mention that it is only 10 minutes prep time? Perfect for if you are still on holidays! So tell me Dear Reader, how do you shop? Do you have a list of things that you need to buy or do you buy what catches your eye? Do you ever have those nonsensical conversations? Step 1 - Preheat oven to 220C/440F and line a tray with parchment and place the trout on the tray. Mix the tom yum paste and oil together. Brush the paste inside the trout and on both sides of the outside skin. Place the garlic cloves inside the trout and sprinkle a tablespoon of fish sauce inside the trout. 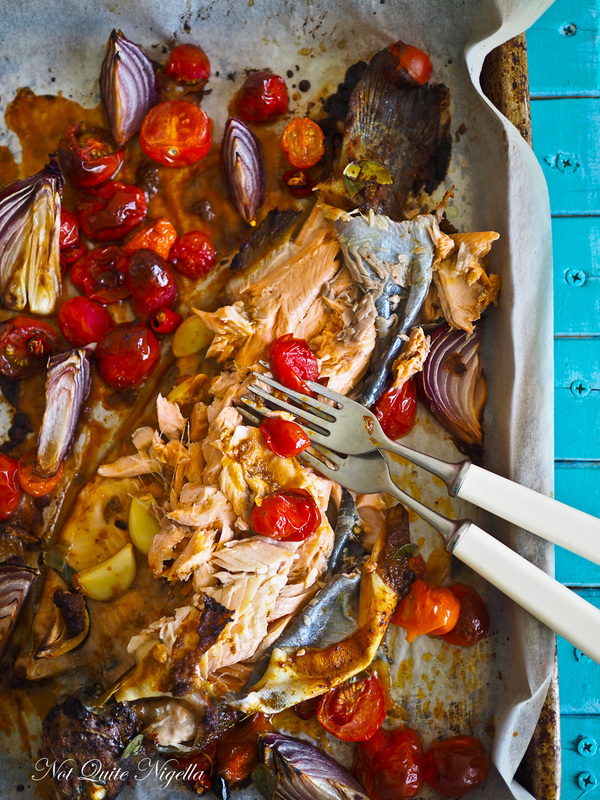 Scatter the tomatoes, chillies and onion around the trout. Lastly top the fish with the shredded kaffir lime leaves and remaining fish sauce. Bake for 25 minutes. Step 2 - Meanwhile make the rice. Rinse the rice until the water runs clear. Add the water, turmeric and salt and bring to a boil. Turn down heat to very low leaving the lid tightly on and cook for 15 minutes. Fluff with a fork. Tip: while rainbow trout can have small bones in the fin area, it is quite an easy fish to debone and remove the centre bone from. Just watch out for the tiny bones that may remain behind. recipeWhat Happens When Korea Meets Canada: KimCheese Kimchi Poutine! recipe What Happens When Korea Meets Canada: KimCheese Kimchi Poutine!